Short-form reviews of new work from Fjerstad and Bastet. The post Observer: Fjerstad & Bastet appeared first on I Die: You Die. LA-based artist Chad Fjerstad’s first LP under his own name is some strange stuff to be certain. 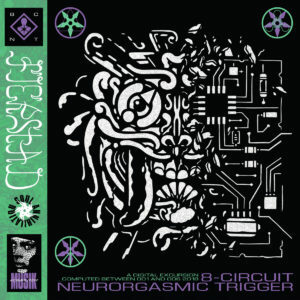 Where his previous output as Fractal Baths reveled in genre agnosticism, 8-Circuit Neurorgasmic Trigger zooms in on a sort of funhouse electro, albeit touched by IDM, glitch and general synth weirdness. Tracks like opener “Banging The Guixian Tam-Tam” and “Gun Guy 88” have deep, head-nodding grooves at their heart, but supplement them with bitcrushed percussion, wild pitch-bending synthlines and circular sequencing that turn each song back in on themselves. Smoother but no less funky is late album track “Kingdom Of Last Left Empaths: Partition D”, which sets up a simple Future Sounds of London type synth-exotica complete with chopped up syllabic vocals, a direct contrast to “Kingdom Of Last Left Empaths: Partition C”, the mournful flipside that actually precedes it in track sequencing. Fjerstad certainly seems happy to unnerve: “Z Babysitter” is a take on the sort of monotone female vocal come-on song popularized during electroclash, but concludes with a sinister rejection. More unpleasant still is “Under the Floorboards”, where synthesized voices discuss cannibalism against a backdrop of growling, cascading bleeps and synth washes. That those songs share space with a song like the dark and soulful “Myrrh Musik” is something, with Fjerstad finding different moods and sensations within his new area of focus. California and deathrock go together like, well, death and rock. 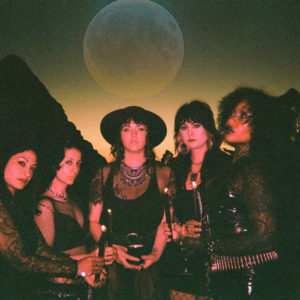 On their debut EP, Oakland’s Bastet play a loose and languid version of their state’s trademark sound that points both to the genre’s garage precursors as well as more recent indie and punk acts who’ve taken a page from deathrock’s grimoire. There’s a jangling ease to a number like “Shadows Of The Night”, which nods along with doomy twang, making tempo changes so small you could be forgiven for mistaking them for the band nodding off. But the laid-back groove of a good portion of these four tunes makes a nice counterpart to the properly sharp vocals replete with classic goth and witchy imagery, and the fuzzy warmth which comes from buttressing basslines with simple synths. With a run-time slim enough to slide under the door of your average crypt, Dawn Of Darkness never risks wearing out its welcome, but it does a solid enough job of establishing the band’s vibe: half spiky, half stoned, all spectral.